You read about the warning signs right here: from the revelation that “fracas” was code for a racially aggravated assault which left a producer in need of hospital treatment, through the pointless petition, the interventions of Amanda Bloody Platell and Louise Mensch, the Mail’s attempt to jump on the bandwagon, and finally The Great Man admitting he was on his way out. And now has come the confirmation. Jezza and the BBC have reached the parting of the ways. Yes, despite the Mail claiming that the Corporation would do everything it could to retain his services, what ultimately happened is that nobody, not even Clarkson, was above the law of the workplace. Star status does not permit you to verbally abuse someone for more than quarter of an hour and then smack them into the nearest A&E. The occasional lapses into what Jezza’s supporters like to shrug off as mere “political incorrectness” - equating lorry drivers with those who murder prostitutes, gratuitous abuse aimed at Pa Broon, sniggering about “black Muslim lesbians”, sneering use of the phrase “special needs”, a diplomatic incident sparked by his comments about Mexico, and significant adverse reaction to his opinions on India - had got worse of late. The N-word incident, apparently leaked by someone on the production team, should have alerted Clarkson fans that all was not well on the good ship SS Top Gear. Referring to an Asian man as a “slope” got him censured by Ofcom. And the debacle over the team’s trip to the south of Argentina will have won Jezza few friends at the BBC, which had wiped his arse over all the other lapses. One smack and he was out. No doubt there will be much wailing, if not gnashing of teeth, from the usual suspects: Richard Littlejohn, any Murdoch pundit (Rupe himself has declared his support), what remains of the Chipping Norton Set, the perpetually thirsty Paul Staines (who is no stranger to aggressive behaviour himself) and his rabble at the Guido Fawkes blog, all will bemoan the sacking. And it will make not a jot of difference. And if Richard Hammond and James May decline to continue their Top Gear presenting duties without Jezza, then they too can be replaced. The show might even bring in - shock horror - presenters who are not white males who worship at the altar of Petrolheadery. It might abandon the money-guzzling stunts and the total lack of regard for the environment. And it might still bring in a similarly sized audience to BBC2. One other thing for Jezza to bear in mind - his entire television success story has been at the BBC. Have a think about that. Then remember that the Corporation owns the rights to the Top Gear brand. Clarkson would be well advised to make the most out of whatever big money deal he signs next - there might not be another. Gross misconduct can lead to dismissal. That rule should never be varied because of star status. The age of Jeremy Clarkson at the Beeb was for a time, but not for all time. 1) By me, as he's a dickhead of the highest level. 2) By the world, because he'll be picked up in nanoseconds by any one of the queue of TV channels currently wooing the guy and offering him the chance to spew his racist lad-bile wrapped up in scripted witticisms without the fetters of the Beeb. OK, Tim - Clarkson's gone and rightly so. But the whole point of TG is it's appeal to petrolheads and it's enjoyable interplay between the hosts. Making it as dry as sandpaper would kill it stone dead. The fans of the show didn't punch Oisin Tymon - why punish them as well? The logic of this comment is remarkably similar to that employed by Master Henry Cole in his interview following arrival at the BBC last Friday in a vehicle that was not a tank. One need not have Jezza to have interplay and appeal. According to the Mail, the police are now taking an interest. For the life of me, I can't understand why the BBC didn't refer the matter to them from the start. It might be a good thing for the show, if it is to continue. This last series of TG and indeed a lot of the recent ones have included a lot of self-indulgent rubbish - the recent 'hilarious' piece about Peugeot being the best example of this, but also the deeply tedious skit where Richard Hammond is marooned in Canada. A programme with smaller presenter egos would have vetoed them - ditto the previous skits about VW advertising etc. 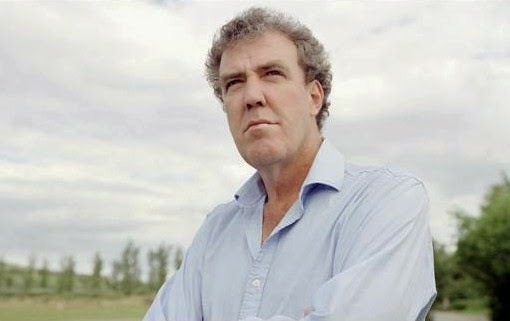 It's also to a bit overly 'anti-PC' - the Argentina shows were just boring, largely because the one big joke they had, about Clarkson 'unintentionally' buying a car with that numberplate and then 'being forced to have it replaced' backfired so spectacularly. They really shouldn't have admitted to having a spare numberplate with them - it was obvious what had happened. A change of presenters and a rethink of the challenges to make them less obviously rigged is long overdue. Not least because most of the current series was obviously filmed last summer - they'd scaled it back to one series a year already. I would be very surprised if Top Gear gets anything approaching the viewing figures it had with Clarkson as a host. Yes Clarkson is a bully and should have been sacked, no question. But it remains to be seen if it will have the same appeal. It's obvious what will happen - all 3 of them will go to Sky (or Netflix) and create a Top Gear clone. The BBC will try and relaunch the show with new presenters, but it will be a flop and will get nowhere near the audience. Meanwhile, Sky will schedule the new show for 8pm on Sunday and it will get an even bigger audience than Top Gear does now. Anyone who thinks otherwise clearly doesn't know the Top Gear audience or the British public. Top Gear is successful for one simple reason: budget. It makes millions because it spends millions. Jezza and the boyz could be funny, true, but not always. Quite often the puns were flat, the ham-acting and set-ups really obvious, the scripts shoddy. What always saved it was the stunning locations, the sweeping helicopter shots and the multi-million pound cars. It's a car show, not the Jeremy Clarkson show. Other presenters are wittier, funnier and smarter - and petrolheads too. Now it's their turn. ".... And it might still bring in a similarly sized audience to BBC2." Nope, it won't - and it certainly won't sell abroad, which was the whole point of Top Gear. While the left may hate Clarkson, the whole thing was the real rock and roll swindle, the money from selling TG effectively paid for BBC3 and 4 and now the Beeb have a massive hole in the accounts. That's the irony, the left hated it, but it paid for an awful lot of things like Stewart Lees show. And why shouldn't there be something dedicated to a love of cars - car fans pay their license fee like everyone else, the whole point of the BBC is to cater for everyone, if you think people will tune in for serious reviews of the new small Honda and economical driving tips, you're in for a shock. If you think it'll sell abroad, you're in for a bigger one. Anon 16:47. The BBC has the rights to Top Gear. I'm not at all sure that it would be possible for Clarkson, Hammond, and May to make a motoring programme that the BBC couldn't object to on legal grounds. Sports fans suffer when their heroes are disciplined for transgressing. Families of criminals suffer for obvious and unavoidable reasons. So if Anon 16:07's logic is extended, no-one would face serious sanction for any reason ever. Top Gear clone on Sky getting bigger audiences than the Been? I wouldn't be so sure, according to BARB, Sky have only a handful of shows being over 1m viewers, and 3 of those were on the sports channels. I've got an idea for a new show. Take all the people who think he should have stayed because they are fans and therefore the offence doesn't count. Line them up and let some other big star punch them in the mouth. I'd watch it! Alternatively, stick with something like the current format, take TWO new permanent presenters with a bit of driving and telly experience (eg Sabine Schmitz and Brian Johnson) and then each week add a guest presenter from the list of the "stars" who did good lap times. And whilst we are pondering about whether the person makes the show, would HIGNFY have survied this long if they had kept Angus Deayton? When he was sacked there was a similar outpouring from airhead worshippers who thought the law didn't apply to him because he was famous - but changing to guest presenters has actually kept the show alive. Good points all from SteveB. Like Adrian Chiles, Jeremy Clarkson will get a fat signing-on fee from a suit at a commercial channel seduced by the Top Gear numbers. Like Adrian Chiles, both suit and jeans will discover that viewers are bizarrely set in their ways. Most of them won't be bothered trying to find channel 74923 on their remote and those that do will see a programme shorn of the BBC's bottom wallet that isn't dependent on keeping advertisers sweet, the army of producers who have centuries worth of collective experience, and access to all manner of weird locations that only the BBC's lustre can provide. And like Adrian Chiles, he'll soon be gone off our screens for good.